The 1980s was not a particulary good time to be an England cricket follower. In fact apart from some success against Australia in the middle of the decade the whole period was pretty grim after Ian Botham’s heroics in 1981. We thought that perhaps we had turned a corner after Mike Gatting led the 1986/87 squad to a 2-1 Ashes victory but we were a long way wide of the mark. There was, inevitably, much confidence for the following summer but the outcome was a first ever home series defeat by Pakistan. The following winter, amidst the Gatting/Rana row, Pakistan won again and in three Tests against New Zealand, and the Bicentenary match in Australia there was little joy and four stalemates. 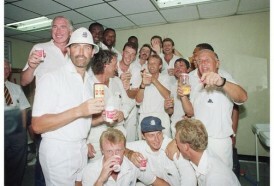 Returning in some disarray in 1988 England found the undisputed world’s best, West Indies, champing at the bit to extend their sequence of five series victories. They had won the last ten games and another “blackwash” was feared. It was an unexpected pleasure therefore to watch that wretched sequence come to an end as England comfortably drew the first Test. Sadly for England though they then became distracted by the soap opera that the captaincy became after Gatting’s dismissal after the publicity that followed a dalliance with a hotel chambermaid, and the visitors won each of the the other four Tests without difficulty. One man who did not get a go at the captaincy in 1988 was former incumbent David Gower and when, after a tourless winter, he was appointed captain for the 1989 Ashes series, he seemed to have done rather well to miss out the previous summer. Of course he hadn’t and to the amazement of most in England, but few in Australia, the summer of ’89 was one of the worst Ashes maulings England has ever received. With a tour of the West Indies to follow it would be fair to say that few were sanguine about England’s prospects in the Caribbean in 1989/90, and there was a great deal of speculation about both the composition of the touring party and the captaincy. It was no surprise that Gower lost the captaincy, nor that Gooch acceded to it, nor that Gatting ruled himself out of contention by accepting an invitation to lead a rebel side in South Africa. What was unforeseen was that Gower, still only 32, did not even make the touring party. Over the years he had done as well as anyone against the various West Indian pace quartets, and in the Ashes debacle of 1989 only Robin Smith, by a distance, and Jack Russell by a whisker, had headed him in the England batting averages. Gower was always frustrating, but at the same time immensely popular, and while it would be an exaggeration to describe public reaction to the decision to leave him at home as an outcry, it wasn’t too far short of that. Less surprising was the omission of Ian Botham. For many, this writer included, the events of that magical summer of 1981 entitled Botham to what amounted to a sinecure in the England side for as long as he wanted it, thus his omission caused disappointment but was impossible to objectively criticise. In 1989 he had, in three Tests, scored just 62 runs at 15.5 and his three wickets cost him 80 runs each. His rather disappointing reaction was to say In my heart I wish the boys well, but my brain tells me 5-0. Had he looked at the reality of the situation, that a fit and experienced replacement might well be required, and knuckled down to a winter of hard work, then he might still have been given a last chance to fill in the gap in his CV. The batting was inevitably light on experience, much depending on Gooch and his vice-captain, Alan Lamb. An obvious concern was the presence, in addition to the captain, of just one recognised opener. Long on years (only Gooch was older) Wayne Larkins had only played six previous Tests, the last of them almost a decade before, but Gooch rated his ability against pace. Robin Smith had, at this time, played just eight Tests. The remaining three specialist batsmen, Rob Bailey, Nasser Hussain and Alec Stewart, had but a single cap between them. The pace bowling consisted of four men born in the Caribbean – cynics suggested that this was a decision made to distract Caribbean governments who might otherwise object to the captain’s past visit to South Africa with a rebel squad, but the reality was that Devon Malcolm, Gladstone Small and Philip De Freitas were all worth their places, and Ricky Ellcock was a reasonable hunch – the disappointment was that a stress fracture of the spine forced his withdrawal and indeed a brief comeback in 1991 apart, ended a promising career. Another West Indian born pace bowler, Chris Lewis, replaced him in the squad. There was much amusement at home, and doubtless hilarity in the Caribbean, at the comment of the Chairman of Selectors Ted Dexter, that England were now capable of fighting fire with fire – another extract from the book of humour that had, after a big innings defeat in the fifth Ashes Test, seen him drawing comfort from the performance of debutant Malcolm Devon (sic), who had taken 1-166. Sadly a similar fate to Ellcock’s befell the second spinner, the uncapped Surrey left armer Keith Medlycott, though in his case it was the rather less painful, albeit equally frustrating yips that were to blame. The main spinner was Eddie Hemmings, though neither he nor Medlycott gained a place in the Test side. The wicketkeeper was Russell, the all rounder David Capel, and the pace pack was completed by Gus Fraser who, at that stage of his career, had just three caps to his name. In fact the pace quintet boasted just 23 between the five of them, De Freitas’ 13 making him the third most experienced man in the party. In the way of Caribbean tours the action did not begin for just short of five months after the side was selected. For this tour their were two ODIs before the first Test was due to be played at Sabina Park. They were ruined by the weather, and nothing in the play that was possible suggested that the order of things was changing, and no one outside the England camp gave the visitors much of a chance in the Tests. The final XI for the first Test saw, in addition to the spinners, De Freitas and Lewis left out with Bailey the unlucky batsman. The West Indies, while no longer quite at their peak, still had a formidable side despite Gus Logie and Curtley Ambrose being injured. The old firm of Gordon Greenidge and Desi Haynes opened the batting, and they were supported by Richie Richardson, Carlisle Best, Carl Hooper, skipper Viv Richards and the ubiquitous Jeffrey Dujon. The bowling was in the capable hands of Malcolm Marshall, Ian Bishop, Courtenay Walsh and Patrick Patterson. The main difference between this England side and its predecessors was their level of fitness and preparation. In the autumn and winter all the players had been on strict exercise regimes, had been thoroughly prepared and were made to feel like a team. In addition there was a plan, albeit a simple one, with Fraser, Capel and Small aiming to bowl a tight off stump line to avoid giving anything away and forcing errors from the batsmen, and Malcolm simply bowling as fast as he could. Richards won the toss on the first morning and clearly had his doubts, but after a brief discussion with manager Clive Lloyd he chose to bat. Greenidge and Haynes set off in imperious fashion and looked untroubled by the England attack. Malcolm, Jamaican born, was not the world’s greatest fieldsman and was stationed at fine leg. He inevitably took some stick from the crowd, mainly light-hearted in nature but not exclusively so, and he caused much amusement when he allowed a Greenidge glance to pass through his legs to the boundary. I had my new satellite dish that winter and recall vividly what happened when, at 62-0, Greenidge repeated the shot. There was no way Malcolm was going to allow the same thing to happen and while he failed once more to get his hands round the ball he had the rest of his body behind it and after hitting his knee it rebounded a few feet forward. There cannot have been many whose thoughts did not run along the lines that at least this time the misfield had cost only one run rather than three, and as Greenidge set off for his second he was clearly with the majority. Malcolm’s poor eyesight meant that his ground fielding, catching and batting were all rather less than reliable but, as Greenidge found out to his cost, when he needed it he had a wonderful arm. A peerless flat throw was in Russell’s gloves in no time and Greenidge was comfortably short of his ground. Richardson and Haynes saw the home side through to lunch but after the interval three quick wickets reduced the West Indies to 91-4 and Malcolm’s dismissal of Richards, lbw to a short one that didn’t bounce, meant that by tea they were in a hole. Fraser had not, at this stage, opened his account. He more than made up for that after tea with a remarkable spell of 6-3-6-5 and it was 164 all out. For years England had, occasionally, gone through the West Indies top order but this time Dujon and the bowlers were not able to rescue the situation. By the close England were almost half way to a first innings lead with just Gooch and Stewart gone. Next day Lamb went on to a magnificent 132 and, with solid contributions from Larkins and Smith, a precious lead of 200 was achieved. The West Indies did a little better second time round but a second lower order collapse left England with a victory target of just 41. Another hundred and it might have been a nail-biting finish, but Larkins made sure there were no alarms and the cricket world was stunned not only by the mere fact of an England victory, but also by the comfort of the nine wicket margin it was achieved by. The trivia buffs had a field day too. It was England’s first victory over the West Indies in nearly 16 years and 30 Tests. Their first innings 364 was their highest total against the World Champions in nearly a decade, and it was more than 20 years since they had dismissed them for less than 164. There were plenty of personal landmarks too, the most surprising of which being that Lamb’s tenth Test hundred was his first overseas at the 46th attempt. The West Indies regained some of the initiative by winning the next three ODIs, the third of which was a late addition to the itinerary, played on the last day of what should have been the second Test at Georgetown a match which, thanks to rain, it had proved impossible to start. England therefore still held their 1-0 lead going into the third Test at Port of Spain where, popular wisdom had it, a distinctly sporting wicket was waiting for the two teams. For England Bailey replaced Hussain and the home side made as many as three changes. Logie and Ambrose were fit again, and Ezra Moseley was selected as Marshall, Patterson and an injured Richards dropped out, Haynes assuming the captaincy. Gooch won the toss and did not hesitate in inviting Haynes to bat. At 29-5 all the concerns expressed about the pitch were confirmed. England bowled well but they had plenty of help. It was their misfortune that Logie, often a stumbling block in the event of a West Indies collapse, got enough support from Hooper and Bishop to score 98 and take his side to 199 – if only Russell had accepted a tricky chance when he was just 17 the innings would have been even more truncated, although that would not necessarily have worked in England’s favour. As it was the pitch had eased somewhat for the start of their innings and at the close it was 43-0. Next day England’s progress was positively funereal as they added just 146 runs in a day that lost only 12 overs to rain. Importantly however they lost only two wickets Gooch, despite looking run down and suffering from a stye, batting all day. After Sabina Park all England hoped for and, for once dared to expect, another healthly lead. In the end it was just 89, and without a valiant 40 from Capel it wouldn’t have been much more than a nominal one, but on this wicket it was potentially decisive. When West Indies batted again Haynes and Greenidge patiently wiped out the arrears and put on 96 before Fraser made the breakthrough. Then the initiative swung back England’s way as, on his way to what turned out to be six for the innings and ten for the match, Malcolm ripped out Haynes, Best and Dujon in four deliveries. Richardson got his head down but by the time the home side were all out shortly after the final day began England needed just 151 for victory – so near and yet so far! By lunch a 2-0 lead was tantalisingly close at 73-1, although that was really two as Gooch had retired hurt with a broken hand. He would not play any further part in the series although, at this stage at least, the true extent of his injury was kept from his team as, to preserve morale, he padded up again after his worst fears had been confirmed. It had been clear all morning that the rain was coming and in the interval it arrived with a vengeance. England were, naturally, as desperate to get on with the game as the home side were to stay in the pavilion. When the umpires took the players out again parts of the ground probably were unfit for play, but that was no excuse for the open disapproval shown by the West Indians who bowled their overs at a rate of less than 10 an hour. Tempers became distinctly frayed on both sides and there was much ill feeling when England, still 31 short with 5 wickets in hand, finally gave up the chase in the gathering gloom. Haynes delaying tactics were condemned in the English press next day although time quickly watered down the disapproval – after all when a great champion is on the ropes he is never going to lie down and give up without a fight. It was with a combination of angst and anger that England fans looked forward to the fourth Test. We could so easily have been going into the match with at least a share of the series guaranteed, but the reality was there was a general feeling that, without the skipper to lead from the front, the West Indies would sweep England aside in the last two matches. Personally despite my not inconsiderable investment in my first satellite dish I was hoping that the Caribbean weather would continue to be unreliable, particularly after the home side comfortably wrapped up the ODI series a couple of days before the Bridgetown Test began. For West Indies Richards and Marshall were back for Hooper and Walsh. England had two enforced changes with Hussain and DeFreitas replacing Gooch and Fraser. Stewart, in just his third Test, was thrust into Gooch’s position at the top of the order. Lamb chose to insert West Indies on winning the toss. Haynes early dismissal promised better things than the 311-5 that the hosts had reached by the end of the day and they went on to 446 the following day. After a rapid and rather fortuitous 45 from Stewart England’s reply settled down to a two man show with Smith scoring 62 and Lamb a gritty captain’s innings of 119. The lead conceded was just 88. England won few friends by slowing down their own over rate in the West Indies second innings but the home side still scored enough runs sufficiently rapidly to leave England a tricky few overs at the end of the fourth day and the whole of the fifth in which to either bat out time or score 356 to win. That latter option was gone by the final morning as Bishop and Ambrose dismissed Larkins, Bailey and nightwatchman Small before the close. The dismissal of Bailey did nothing to help the already soured spirit in which the game was played. Ambrose’s delivery was a little wayward and although Bailey attempted to play it he got nowhere near the ball and, after it brushed his hip, Dujon took it down the leg side. There was what seemed to be just a token appeal but Richards, from short leg, suddenly charged towards the bowler’s end furiously wagging his finger at umpire Lloyd Barker. It certainly intimidated me, and I was sat comfortably in my armchair on a different continent. Barker, who had already turned to walk towards square leg for the start of the next over, gave the decision. The incident was quite disgraceful and a bleak one for the game, particularly when respected commentator Christopher Martin-Jenkins called it for what it was, and was promptly accused of racism. There was no ICC code of conduct in those days – had there have been Richards was certainly guilty of a level three transgression, and a minimum ban of two Tests, but as it was nothing happened to him despite every moment being captured on camera. Next day despite such a confidence sapping setback England got remarkably close to saving the game. That they did so was largely due to a brave and dogged knock from Russell who, coming in at five, batted for more than 5 hours for 55. When he was sixth man out at 166 it looked like he and Smith might just take England to safety, but after the doughty wicketkeeper was comprehensively yorked by a magnificent delivery from Ambrose the big man ripped out Hussain and the bowlers in the space of a few overs leaving Smith stranded. The light was fading fast and at the end it was doubtful, despite there being a dozen overs left in the day, whether even half of those would actually have been bowled. The 8-45 Ambrose ended up with were to remain the best figures of his magnificent career. And so to Antigua and the best batting wicket in the Caribbean. The fifth Test was the first time since the war these two sides had gone into a final Test all square so there was still hope for England. That hope was boosted by the home side having to make three changes, Hooper, Walsh and Eldine Baptiste replacing Best, Moseley and Marshall. England were unchanged although many, stand-in skipper Lamb in particular, wanted to see Gower summoned from the press box to take a batting berth. Lamb decided to bat on winning the toss and saw all his batsmen make a start but none go on to make a score a higher than Bailey’s 42. To make matters worse Smith sustained a finger injury that was to cause him to retire hurt in the second innings. England’s 260 was never going to be enough and its inadequacy was clear by the close on the second day at which point Greenidge and Haynes had already scored 228. They added 70 more next day and although no other West Indian scored more than 35 the lead was 184 which, by 32, was too many for England as their second innings folded for just 154. Before the series started there cannot have been many England supporters who would not have settled happily for a 2-1 defeat. As it was there was a great deal of disappointment over the outcome of a series which England deserved at least a share of. It would be the new century before, at home, England finally took a series from the West Indies again, and more than three years on from then before they won in the Caribbean, but in the early spring of 1990 the aura of invincibility slipped, and there was a subtle shift in the balance of power between the two sides. If you were watching this series on Sky Martin, you must have been an ‘early adopter.’ This was the first overseas series shown live in the UK.